21988LF is rated 4.2 out of 5 by 128. 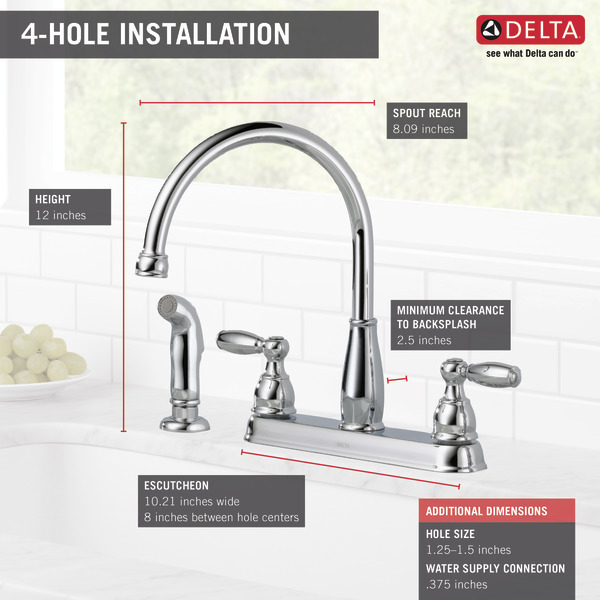 This Delta® faucet provides a practical, hardworking solution that will stand the test of time, every time. Delta is a reflection of your personality and is as individual as you are. Rated 5 out of 5 by Rue15 from Looks nice. Easy install and works grear. Rated 5 out of 5 by DougM from Great kitchen Faucet We bought this faucet 2 weeks ago to replace a faulty Peerless faucet. Beautiful faucet love the high faucet neck on it.makes washing deep pans so easy even without needing to use spray nozzle. The spray nozzle it self also very nice. 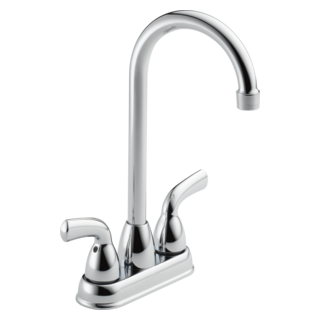 Is easy to install this faucet. Rated 5 out of 5 by Samosa from Grate product I bought this product a month ago because one of my friend said delta product is good not only for the life time but the customer service is excellent. the price as well as the assistant / Advise is grate. Backed by the real warranty. I would recommend to buy this marked product and register the product. You will never disappointed for the life. Rated 5 out of 5 by Elissa from Well, it's my third of this style,but.... 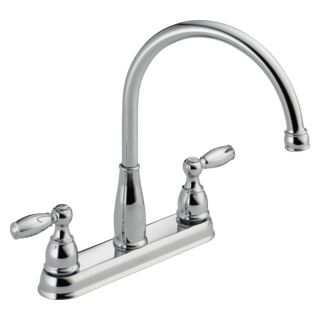 I had it first...5 years ago..then got one for my Mothers kitchen last year..needed a new faucet for a summer property, and there was no question what I was going to get. Easy style, clean finish..not one problem yet! 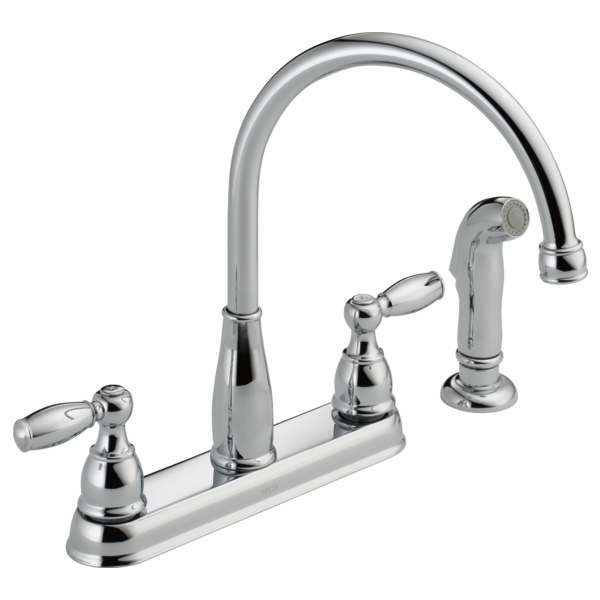 Rated 5 out of 5 by Tony from Ideal Features I bought this faucet as a replacement, and it met all of my expectations. The ease of installation was a game winner for me. Rated 5 out of 5 by MHV19 from Just what I wanted This faucet was bought to replace an old leaky model of another brand. I like the high arc of the spout and the lever handles. It is easy to turn on and off. The spout swivels smoothly and the sprayer works great. This is an easy to install unit. Model # 21988LF. The base is leaking. What repair kit do I need? Is there a video I can watch to help me repair. 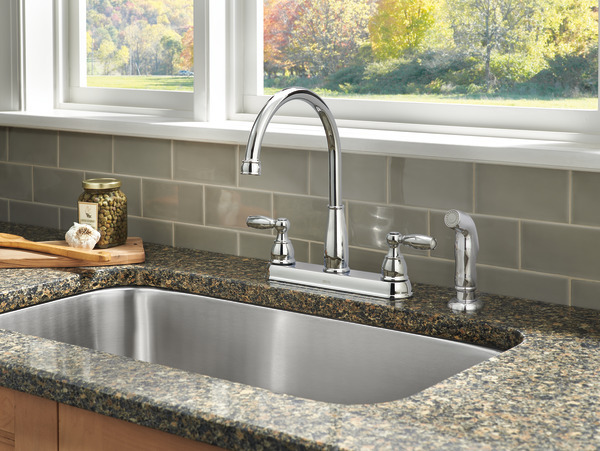 Can the faucet and handles be installed directly on the sink without the base? I did not out the sprayer holder on.How do I remove the snap on connection to the water supply to put the sprayer hose through the holder? Reach up at the very top of the connection and squeeze the two tabs together and gently pull down on the hose. They only move about .05&quot; inward, but it will release. How come I can't buy a replacement spout for this faucet? Why don't you print on your box that this is made out of plastic and not chrome? I was very upset when I found this out - after it had been installed. Is there a thick deck extension for this faucet? I can find a lot of other Delta faucet deck extension but none for this model. Will a extension kit for another model work? I only need to extend the hot and cold connections a small amount.